Nomad Press (VT), 9781619307049, 96pp. Why are rivers and streams important to life on Earth? 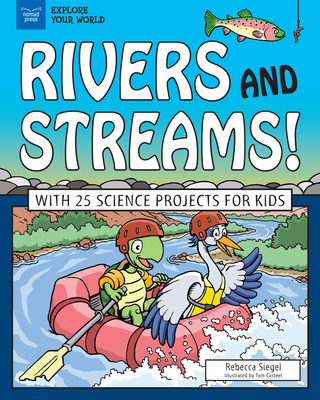 In Rivers and Streams With 25 Science Projects for Kids, readers ages 7 to 10 dive in and discover how rivers change the shape of the land while plants, animals, and humans change the shape of rivers. Through fun facts, engaging content, and essential questions, kids learn about the vital role that rivers and streams have played in human history and explore the ways rivers and streams might affect our future. Science experiments that promote critical thinking and creative problem solving encourage kids to make their own discoveries about the waterways they might pass every day. Talking about earth science means talking about climate change. How are rivers affected by our changing climate, and what can we do to help rivers and streams stay healthy in their changing environment? Rivers and Streams encourages kids to think creatively as they search for actionable solutions to the problems faced by today's waterways. Rivers and Streams is part of a set of four Explore Waterways books from Nomad Press. In the Explore Waterways set, readers ages 7 to 10 learn about the waterways of our world, including the what, where, how, and who about the origination, content, and aquatic life that water contains. Through science-minded STEAM projects and experiments that encourage readers to think of waterways as part of a larger ecosystem, kids develop critical and creative thinking skills about the role waterways play in our world. Titles in the Explore Waterways set include Marshes and Swamps With 25 Science Projects for Kids; Lakes and Ponds With 25 Science Projects for Kids; Oceans and Seas With 25 Science Projects for Kids; and Rivers and Streams With 25 Science Projects for Kids. Rebecca Siegel is a writer and editor who has written about topics from computers to medicine, from bread and cheese making to printing, and from navigation applications to goat milk soap. She is happiest when she's learning and writing about something new. Rebecca lives in Thetford, Vermont, along the west branch of the Ompompanoosuc River, which runs from the valley below her house to the Connecticut River. Tom Casteel is an illustrator and cartoonist with a master's degree from the Center for Cartoon Studies. Tom has illustrated several books for Nomad Press, including Explore Ancient Chinese Myths! With 25 Great Projects and The Oregon Trail: The Journey Across the Country from Lewis and Clark to the Transcontinental Railroad. He is working on his first graphic novel.